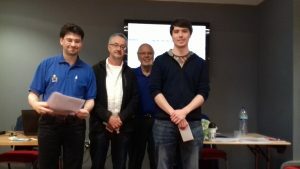 Simon Layhe (far right) receiving prize as joint winner of the 2018 Rapid-play Congress in the Minor Section. 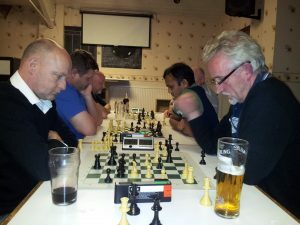 One of several photos from our 2018 Club Blitz Night on 23rd May. 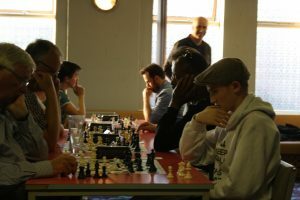 Nigel Gardner (partly-obscured) playing Josh Cross; Phil Wright playing the hidden Mike Keenan and Harry Gardiner (with cap) playing Reinhard Haack (also hidden) and the two bald (wise-men?) 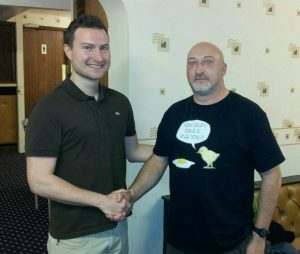 in the background Dave Price and tournament controller David Hulme. 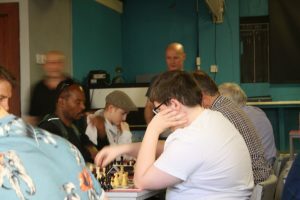 Round 3 of the Blitz night 23rd May 2018 – Rick Renegade waiting for opponent, Simon Layhe (obscured) playing father Neville Layhe; Julian Bulbeck leaning forward to play Ola Titiloye; Phil Wright (partly obscured) playing Karl Lockett. 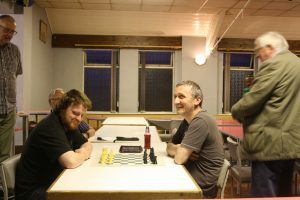 Round 2 of the Blitz night 23rd May 2018 – from L to R – Reinhard Haack vs Harry Gardiner; Mike Keenan vs Phil Wright; Lukasz Michalek vs Richard Hind under the watchful eye of the Controller. 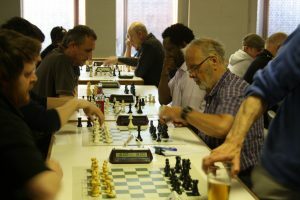 All ready for the Armageddon Play-off for the 2018 Blitz Trophy between Rick Renegade (on left) and Julian Bulbeck, with Mike Keenan watching from the left and Reinhard Haack on the right. 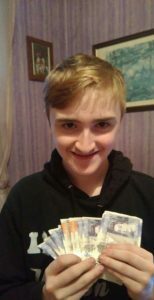 Harry Gardiner with his first congress win at the Newcastle mini congress. 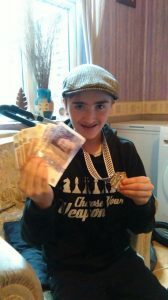 He had a clean sweep with 5 points. 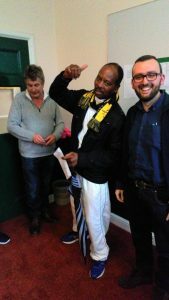 Phil Wright in jubilant mood collecting the kangaroo prize at The Newcastle Mini-congress in April 2018. 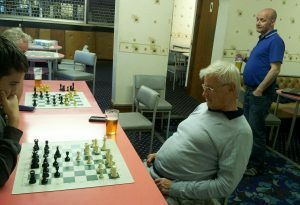 David Hulme playing Steve Ballantyne, with Martin Gill playing Rakshpal Khandekar during the 2015 Club Blitz night. 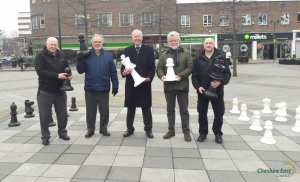 Les Hall, Neville Layhe and Dave Price Promoting Chess on Crewe Square with two Cheshire east councillors.